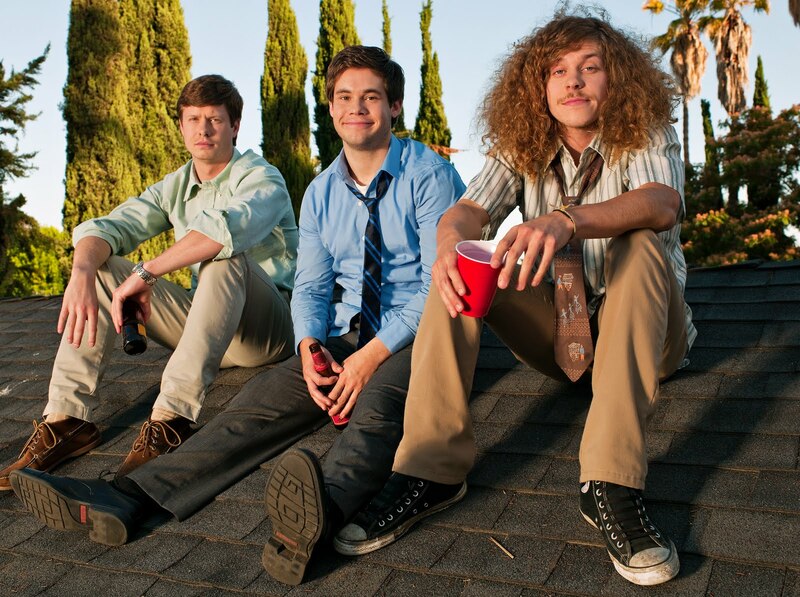 Earlier this month I stumbled upon a new show on Comedy Central called Workaholics. It's not the type of show I would normally watch more than once. 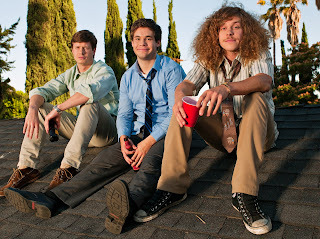 Full of bong hits, practical jokes and frat boy antics, Workaholics seemed at first glance a bit "young" for me. The show follows three friends (term used loosely) Blake, Anders, and Adam, recent college graduates and roommates, who work in cubicles in a big telemarketing conglomeration. Much of the humor rests on their debauchery, drug use, and misfortune in love and friendship. No matter how I felt at the premise of this show by the end of the first episode I realized: I'm hooked. This show isn't just about throwing parties and taking shrooms, it hints at something deeper and speaks to the current situation of the twenty something. Workaholics isn't just getting a laugh from its target audience. It's also eviscerating us. The big difference between this show and other movies and shows of its kind starts with the age and time frame of the main characters. All three are fairly recent college graduates, but the actual amount of time they've been out seems hazy (I can relate, have I been out of school two years? Three? It's beginning to mush together). Their days of frat parties, all-nighters and drug filled ragers should be fading into their own rose-colored histories. The guys are, of course, clinging desperately to the few remaining drips from the keg. The parties that they do throw are worth investigating here. The show does a nice job of not leaning too heavily in either direction in regards to the nature of their parties. How easy it would be to have everyone love their wild parties, or to have everyone think of them as "losers" and have all their parties go unattended. Instead, the crowds in their parties float by, listless and with red cup in hand. These scenes have a cutting poignancy for me. I'll still attend the occasional party, but after an hour doesn't it all just seem... exhausting? Their employer, too, strikes this beautiful non-blatant balance. Their place of work is by no means absurd, with a staff as varied and unrealistic as the main characters. But they're also not just a room of drab office drones. One gets the feeling that if the camera were to make a left instead of a right down the row of desks we'd see something very human and real unfolding in cubicle 2A. Workaholics' ability to balance a realistic work setting shows post-undergraduate prospects for what they truly are today: grim. In each of the three main characters we see a different aspect of the slacker. The show takes the normal attributes of the current interpretation of the lazy underachiever and splits it three ways. First we have Anders, an egocentric "post-jock." He rests on past laurels and has an inflated sense of entitlement and self. When he tries to convince party crashers that he can take them on because he swam varsity in college the typical jock boast is spun on its ear. Like most of us would, the intruders ignore the threat, leaving Anders to comment that they didn't even bat an eye at his swimming abilities and that "Phelps changed everything." Adam takes the conniving trait of the typical slacker and amplifies it into his whole persona. He's the schemer of the group, coming up with terrible plans and always looking to put himself ahead of his friends (especially Anders). When the gang gets holed up in the workplace after dark with suspected burglars, Adam "takes one for the team" and eats an inordinate amount of psychedelic mushrooms. He becomes, naturally, completely useless in the ordeal. Finally we have a sort of unkempt wild man in Blake. Don't let the long hair and wide-eyed stare fool you. Blake may be the most complicated character on the show. He is equal parts absurd and endearing. For every wild, ludicrous idea he has (like wearing a bear costume for an entire episode) he is also the most sensitive of the bunch. His goals for each episode are simple and normally come to fruition. He is the most morally sound (remarkable as that may seem) and he is the character most often rewarded. Finally a note should be made about the drug use in the show. It is done with such a casual sweep that you may find yourself taken in by the culture of the show. Heading off to work? The guys take a quick bong hit. Camping out in the office? They do lots of mushrooms. Bored at work? They try Ipecac (okay, so that one may not be very casual). And though there is a lot of drinking and drug use in the show, it seems to mirror the current state of mind of the twenty-something. In a world where crack is still very much whack but pot is basically legal, the attitude toward drugs in Workaholics mimics reality very astutely. All of this; the post-party, the slacker divided, and the flippancy of drugs, it all points to a somber view of reality. Our main characters seem completely aloof to the blandness of the world around them. And through their nonchalance the true terror of modern life lurks. Complacency, prospect-less one track jobs, and a fuzzed out blur on reality all hide under the surface of this show. Just wait for the smoke to clear and the keg to run dry.